Buncombe Bob · Arthur L. Shelton · ?? An Army Travels on Its Belly · Clemence Haskin · ?? Messiah vs. Messiah vs. Messiah · James Oneal · ?? Desire · Lou Wylie · ?? Report of a Returned New Yorker · Bob Brown · ?? An Immigrant Father · Anthony M. Turano · ?? 330-334 · Secretary Tobin Meets the Press · Maurice Tobin, Joseph Loftus, Windsor Booth, Blair Moody, May Craig & Lawrence E. Spivak · sy; from a broadcast of Meet the Press on the effectiveness of the Taft-Hartley ; Law and old-age pensions, with Secretary of Labor Maurice Tobin, Joseph ; Loftus of the New York Times, Windsor Booth of Time, Blair Moody of ; the Detroit News, and May Craig of the Portland (Me.) Press-Herald. 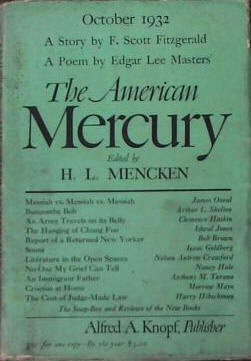 ; Lawrence E. Spivak, editor of the Mercury, presided.